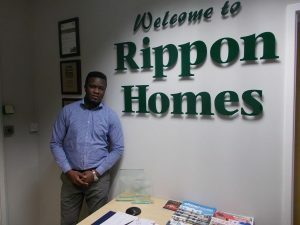 Mansfield based housebuilder Rippon Homes has appointed Modou Njie as a Quantity Surveyor at its head office at Ransom Wood Business Park. Now with a wealth of knowledge and experience in the construction industry, 29 year old Modou began his journey in to the industry in 2011, studying a BSc in Commercial Management and Quantity Surveying at the University of Wolverhampton. After working as a trainee Quantity Surveyor throughout university, the father of one knew he wanted to continue within construction, working as an Assistant Quantity Surveyor for a year before deciding he wanted to complete post graduate study in Construction Project Management. In 2016, Modou won the Society of Construction and Quality Surveyors ‘Most Outstanding Graduate’ award. Modou said: “I am enjoying my new role here at Rippon Homes. I aim to monitor all budgets of projects while completing all allocated projects within the specific time frame. For further information on other career opportunities at Rippon Homes, visit https://www.ripponhomes.co.uk/careers/ or follow the LinkedIn page https://www.linkedin.com/company/18433991/.